Four-legged friends are a big deal to us! First of all – and most importantly, find a dog-friendly venue that allows dogs on the premises for the whole day. If your prefered venue doesn’t say anything about allowing dogs don’t just assume they won’t allow it, you can always ask them to be certain. If the venue give it the go-ahead then make sure you follow their rules if they have any, for example you may have to keep the dog on a lead during certain times. It is also important to think about where you may want to stay after the reception and consider looking for a dog-friendly bed and breakfast. We also recommend setting a plan in place if your dog needs to leave. You never know what might happen on the day or how your four-legged friend will cope with it all, make sure you have arrangements set in place before the big day so you have absolutely nothing to worry about during your wedding. Giving your dog an active role in the wedding ceremony can seem like a good idea at the time, but it is important to consider their personality to then determine what role would be best for them. For example, If they don’t walk well on a lead then it is probably best to not have them walking down the aisle as they could get distracted. 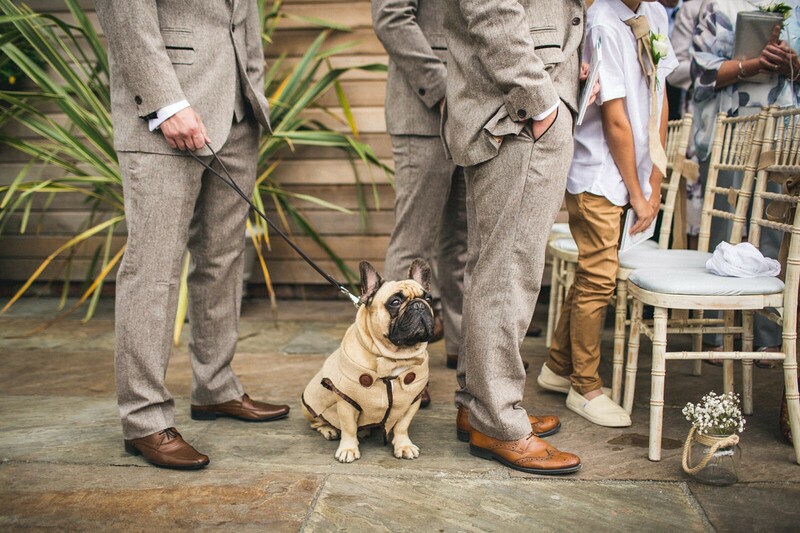 Making sure your guests know that your dog will be attending the wedding day is super important. You should also consider letting your photographer know, or find a photographer who has worked with taking pictures of animals before. That way they will know what to expect and will know to bring the correct equipment on the way. Incorporate your dogs collar colour into the colour scheme of your wedding, or add other accessories with that will tie in nicely with the bride and groom. Take a look on Pinterest for other dog accessory inspiration. Remember to also bring your dogs favourite toys or treats to keep them entertained when you need to.